Jeanne came over to my place this evening for some flourless chocolate cake, Rex Goliath 47-Pound Rooster Pinot Noir, and a present to celebrate her birthday. Strangely, we took no photos during our eating, drinking, and knitting. But I do have a few pictures from earlier today. I was working at my computer when I heard a little tearing sound. Grease a 7- or 8-inch springform pan or round pan. Line bottom with a circle of wax or parchment paper and grease paper. Break chocolate into pieces and put with butter or margarine into a microwave-safe bowl that will be big enough to ultimately hold all the ingedients. Cover bowl with plastic wrap and microwave until chocolate and butter are melted, being careful not to burn them! Remove from microwave. Stir until chocolate and butter are well mixed. Add sugar and mix well. Add eggs and mix well. Sift cocoa onto mix and stir until just mixed. Pour into greased pan. Bake at 375 for 25 minutes or until top has formed a thin crust. Cool cake for 5 minutes, then invert onto a plate. In a small microwave-safe bowl, melt broken chocolate with butter. Stir until smooth. Stir in milk, corn syrup, and vanilla. Set aside to cool slightly. When glaze is cool, pour onto center of cooled cake. Use spatula to smooth glaze and coat sides. Chill about 10 minutes to set glaze. Posted by Chris on Wednesday, January 11th, 2006, at 10:21 pm, and filed under Gluten Free, Recipes, Those Cats. YIPPEE! RECIPE!! I’m having that for MY birthday! 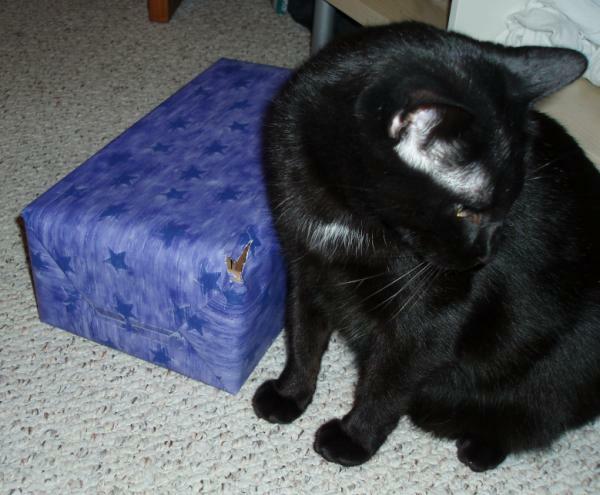 Jamal would totally eat the corner off the wrapping paper…cats can be so weird. I love them. Thanks for the recipe Chris! J is a vegan (but he will eat eggs from our boss’ mom’s chickens because he knows they are spoiled rotten as no chicken on earth should ever be). So, even though that recipe has eggs, we could try it! Ah, the innocent look. 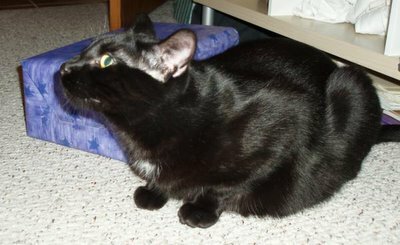 Part of the Chaoscat Creed is to be able to look completely innocent and faintly offended at your implication – all the while magnificently ignoring the large chunk of paper hanging out of his mouth. your recipe sounds much easier than mine (taken from America’s Test Kitchen). Chaos… such a cutie pie. He really keeps you on your toes, huh? Maybe Chaos thought Christmas had come early! Ophelia likes shred newspapers so we have to be careful where we leave them. The recipe sounds really good. I’ll have to give it a try. Just wanted to stop in and say hi – just found your blog, and it is fun. Cute cat! Aw! 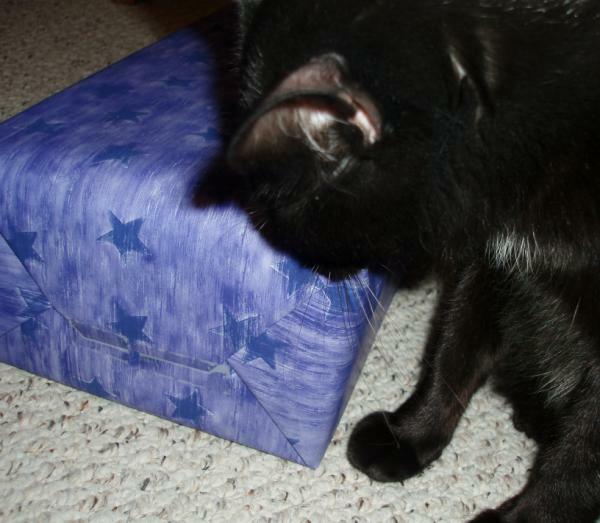 Chaos just wanted to help her unwrap!! YUM! That cake sounds great! Thanks for sharing the recipe!! It’s so simple & the best part is I always have all the ingredients as my “staples” in the kitchen! I’m stuffed just reading it! Chaos need s apresent. Don’t you ever get him presents? Poor boy. Heh. Oh, woe is Chaos. Woe is he… 🙂 Jeanne brought him a present last night – a cute sparkly ball toy. He looked at it with the utmost disinterest, the snot. Yum, I’ve got to try that recipe. Mix it all up and drop balls on an ungreased cookie sheet. Pop ’em into a preheated oven 325F for about 8-10 minutes, don’t burn them, they turn into evil, vile anti-cookies if they get burnt and they’re loads better completely cooled than they are right out of the oven. But, man, they’re good! Aww. Lookie that. Your own personal present opener. Aspiring Crazy Cat Lady – Yum. I’ve made that recipe, but without the cocoa and vanilla. Must try your variation! That recipe sounds delicious…despite my aversion to cooking, I may have to give that a try. Ah, the innocent lookaside, I know it well. So funny. She used to. She’s moved on to bigger and better things…like Christmas tree ornaments shaped like candy canes. Did I mention I’m all weird too re food intolerances. I’m a lactose/yeast/egg yolk intolerant vegetarian. Eating out can be a little bit of challenge. As you will know for sure….